2017 Topps Chrome Baseball Factory Sealed 8 Box HOBBY JUMBO CASE-40 AUTOGRAPHS! We are proud to offer this Brand New Original Factory Sealed HOBBY JUMBO CASE of 2017 Topps Chrome MLB Baseball! This Factory Sealed HOBBY JUMBO Case includes EIGHT(8) Factory Sealed HOBBY JUMBO Boxes! Each Factory Sealed HOBBY JUMBO Box includes 12 Packs and 12 cards Per Pack! 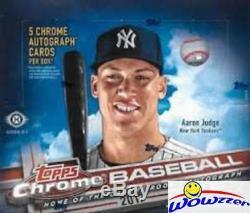 PLUS Each Factory Sealed HOBBY JUMBO Box Includes FIVE(5) CHROME AUTOGRAPHED Cards! So you GET FORTY(40) AUTOGRAPHS in this 8 box HOBBY JUMBO Case! Look for Hot Rookie Cards, Refractors and Autographs Cards of all the Top Rookies including AARON JUDGE, Andrew Beninitendi, Yoan Moncada, Andrew Benintendi, Dansby Swanson, and Many More! The 2017 Rookie Class is Absolutely Loaded! Collect the Biggest Stars and Rookies from Series 1 and 2 on Chrome Technology! Look for Collectible NEW Inserts, HOBBY Only Orange and 1/1 SuperFractors, 1/1 Printing Plates and Much More! Good Luck with your pulls! With a fresh wave of new stars and impact rookies, don't miss out on 2017 Topps Chrome Baseball! Every Year this product is a Home Run!! Configuration: 8 boxes per case. All of the season's biggest rookies will be featured with rookie cards and ON-CARD rookie autographs, making 2017 Topps Chrome Baseball a can't-miss release of 2017. A rainbow of colorful chrome parallels will be featured along with new insert subsets and autograph content revolving around the game's brightest young stars. Each Hobby Jumbo Box will deliver five autograph cards PRODUCT DESCRIPTION ROOKIE AUTOGRAPH CARDS Rookie autograph cards are a pillar of the trading card landscape and Topps Chrome Baseball is the Home of the Chrome Rookie Autograph! Along with the base chrome autograph card, 2017 will also feature the following sequentially numbered color parallels: Refractor: sequentially numbered. Blue Wave Refractor: sequentially numbered. HOBBY SKUS ONLY - Gold Refractor: sequentially numbered. Red Refractor: sequentially numbered to 5. HOBBY SKUS ONLY - Printing Plates: numbered 1/1. INSERT CARDS 2017 Topps Chrome Baseball will showcase a compelling array of collectible insert subsets. Collect the famed 1987 Topps Baseball design on chrome technology. 1987 TOPPS BASEBALL Featuring the biggest MLB veterans and rookies on one of the most recognizable designs of all time. Look for specially-inserted on-card autograph variations! FUTURE STARS Highlighting the top young stars in MLB. FRESHMAN FLASH Showcasing the brightest MLB rookies on a vibrant insert design. Parallel cards for the above-mentioned insert sets will include, but are not limited to: - Orange Refractor: sequentially numbered to 25. Also look for Base Card Image Variations of notable subjects from the Base set! LIMITED ADDITIONAL CHROME CONTENT Additional insert and autograph content has been added to 2017 Topps Chrome Baseball to deliver the utmost in collector value. MLB Award Winners A subset dedicated entirely to previous MLB award winners. Guaranteed at least 1 per case! - Also look for low-numbered autograph variations! Bowman Then & Now The hit subset from 2017 Topps Series 1 resurfaces on chrome technology. Sophomore Stat Lines Autographs Featuring the impressive statistical accomplishments of the game's brightest young stars. Parallel cards for the above-mentioned insert and autograph sets will include, but are not limited to: - Orange Refractor: sequentially numbered to 25. BASE CARDS The extensive base set of 2017 Topps Chrome will include the biggest stars from Topps Series 1 and 2 on chrome technology, including the most current and collectible rookies. Base Cards - Refractor - Prism Refractor - Negative Refactor: limited. Wait to pay until all items have been won OR 7 days after oldest item was won. (Please Note - we are not open on the Weekends and Holidays). We will NOT list a lower value or mark orders as gifts. We answer all emails within about 24 hours, Monday through Friday, and work to resolve all problems as quickly as possible. We answer all emails within about 24 hours Monday through Friday. We are an Internet only company; we do not have a retail location. Get business information that counts! - Vendio Counters are active content free. The item "2017 Topps Chrome Baseball Factory Sealed 8 Box HOBBY JUMBO CASE-40 AUTOGRAPHS" is in sale since Friday, September 22, 2017.